Quickly and easily make small tools magnetic to keep those hard-to-handle screws and nuts in position. Simply insert a screwdriver, nut runner, etc., into the hole, pull it out, and it’s magnetized! For extra magnetic strength, leave the Magnetizer on the tool while in use. 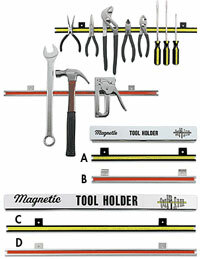 Simply pass the tool through one of the channels on the side of the magnet to demagnetize it. Then the tool can be safely used with computers and other magnetically sensitive equipment. It’s the perfect accessory for machine shops, manufacturing plants and anywhere people use screwdrivers and other small tools!